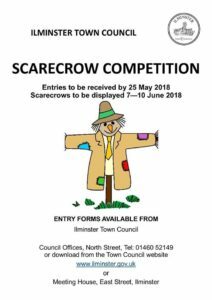 Ilminster Town Council is continuing its annual Scarecrow Competition to coincide with the Ilminster Midsummer Experience. This is a great event for all the family. Last years Scarecrow directory is available via the Town Council website here. This year’s directory will be available from the end of May. Competition details and an entry form will be available from the Town Council in North Street and from its website. Entry form and guidelines here.